Speaking of IKEA... This year I revamped my dry erase marker system with new storage and a new style of marker. 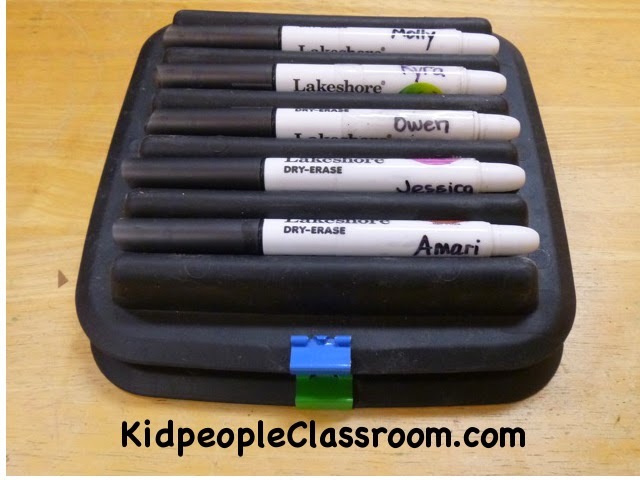 For many years, my students used the fat dry erase markers with chisel tips when they wrote on white boards or wipe off envelopes (see previous post). They were just the ones I always purchased during back-to-school sales. The problem was that kindergarteners don't always have great fine muscle control yet, and the chisel tips got pushed in unintentionally (well, mostly unintentionally). You can pull the tips out with needle nose pliers, readily available at dollar stores, but they sometimes get smashed and it's one more thing to do in a busy day. I never knew which students were having this difficulty because I kept our dry erase pens in a communal basket, so I couldn't address the problem with the kids who needed it most. Yippee! Five markers lay perfectly in the spaces. In the photo below you see I turn the tray over so the pens just lay on top, but you can keep it right side up to hold six pens. I had to think a bit for a way to label the trays so there could be one for each table-- they are made of a rubbery plastic which nothing sticks to. The solution turned out to be the trusty old binder clip. I got smallish ones in multi-colors and clipped one to an edge of each tray, taking off the metal pincher grips on the clip once it was on there. We store them on a shelf and the kids just grab their tray and take it to their table. Works beautifully. The other little detail I stumbled upon through all this was to discover finer tip dry erase markers. Don't ask me why I didn't try these before- duh. The tips on the finer point pens make a more appropriate line than the fat ones, and are actually hardier than the chisel tips. This year I tried Expo and Lakeshore brands, and both work well. You can see them in the photo. Don't forget to shop the sales! For dry marker erasers, I use old black sweatshirts, cut into small pieces. Black doesn't show the ink. If you don't have old sweatshirts you can buy a quarter yard of new fabric for very little money and cut it up. Micro fiber cleaning clothes work well, too, and are available at dollar stores. I've only found them in light colors though, and they tend to look quite dirty, quite quickly. Hope these tips are useful to you. I'd love to hear! Love this idea! We also use little black gloves and socks to erase because there are so many of them around without partners each year! They love it when I cut the fingers off the gloves and they can just cover one finger to erase! Cool Idea! 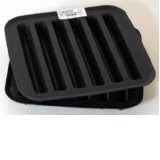 I was about Buy Pen Tray. Thanks for giving me a wonderful ideas on this. Keep exploring and sharing.